The road trip with my daughter came to an end as we arrived in Spring Hill, Tennessee. I enjoyed a lazy run through the country side. There were no sidewalks anywhere. But no matter because I only saw two cars the entire time. Both passed slowly, making sure we both had plenty of room. One even slowed down to talk for a minute, which I thoroughly enjoyed. Again today I played with speed intervals, speeding up for a few minutes, then returning to normal pace. It felt pretty good. I did some work before running this morning. I actually had a couple of conference calls. As a result, I spent some time thinking about the day job. There is always an assortment of problems that I get to solve. Today is no different. I was able to sort a few unresolved things out by the time I returned. Mainly however, I thought about my daughter who I a have gotten to spend that past 3 days with driving across the country. I have loved this time. I am thankful for the relationship that I have with her (and with all of my children). I love my children. I love being their Dad! Especially when I can be a Father for a 2,000 mile stretch! The A2B Journey continued its course through Cabazon, California. A few interesting sights along the way. First was the Morongo Casino and Resort, with a 27 story hotel that is strikingly set against the San Gorgonio and San Jacinto Mountains. A mile or so later, I found myself weaving through a herd of dinosaurs at The World’s Biggest Dinosaurs museum and store. This may look familiar to fans of Pee Wee’s Big Adventure (Look out, Mister Potato Head!) 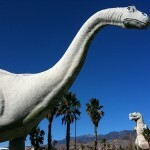 Interesting place, Cabazon! 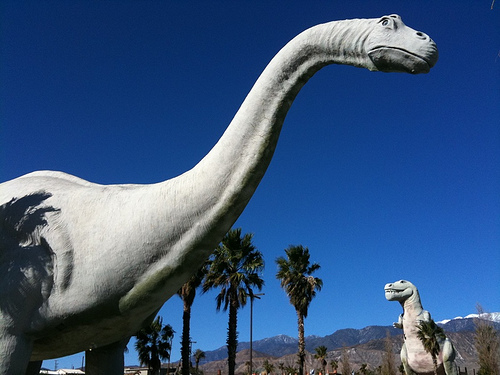 Outlet malls, Casinos, and Dinosaurs! Oh my!